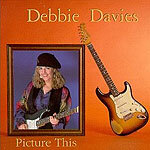 Southern California's Debbie Davies drives another nail in the coffin of the image of the guitar slinger as necessarily male. Joining Bonnie Raitt, Sue Foley and Joanna Connor as a frontline electric blues/rock guitarist, Davies shows a deft touch on her solos and a strong rhythmic sense throughout. The music here is uptempo boogie, a la Anson Funderburgh or B.B. King, and Davies maintains a high energy level on every song. She's not quite as good a singer as she is on her axe, but she's passable. Anyway, as with Stevie Ray Vaughan or Johnny Winter, you're buying this album for the guitar solos.